Since day one that I started using Android device, i've always sticked with GoKeyboard because of its cool features. 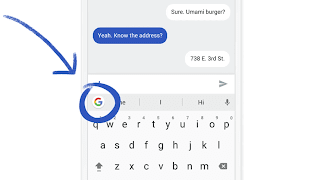 But since the launch of Google Keyboard (Gboard) in December 2016, i ditched the GoKeyboard because of its annoying ads and news that it's spying on our privacy. Ever since i moved to Gboard, my typing experience has really improved because of its unique features, easy to locate emojis/gif by just a simple search, and more interesting features and easy customizations. If you are already using Gboard, am sure you will attest to the fact that it beats other mobile keyboard apps out there plus it's ads-free. The news now is that, Gboard has been updated and now support 40 more additional languages including Japanese, making it 120 languages in total. The latest version of Gboard now support 120 languages, although Google already has a keyboard for non-Latin script languages. In addition to the update, you will get access to four sticker packs by default (previously Gboard only included stickers if Google's Allo messaging app was installed on the device). Other notable features seen on Gboard include Search right in the keyboard. And, it also adds GIFs, emoji-centric tools (including type and scrawl to search), and you can also voice type using the Gboard microphone button at the right hand side instead of typing with your fingers. Where Can I Download/Update Gboard App? The latest version of Gboard is already live on Playstore. Head over to Playstore and Download the keyboard (Download Here). You can as well download from ApkMirror Here. I still think Go keyboard is better. Nice features there but still a security concern.